English: Theseus, whose ship is shown in the distance, has just left Ariadne and Naxos, when Bacchus arrives, jumping from his chariot, drawn by two cheetahs falling immediately in love with Ariadne. Bacchus raised her to heaven. Her constellation is shown in the sky. English: The theme of Bacchus and Ariadne is based on the classical authors Ovid and Catullus. The painting belongs to a series commissioned from Giovanni Bellini, Titian and Dosso Dossi, for the Camerini d'alabastro (Alabaster Room) in the Ducal Palace, Ferrara, by Alfonso d'Este, Duke of Ferrara, who in 1510 even tried commissions to Michelangelo and Raphael. This painting substitutes a painting from Raphael. 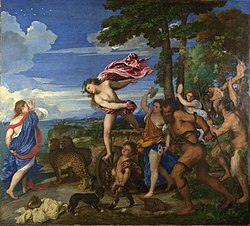 Between 1518-1525 Titian painted also Worship of Venus and Bacchanal of the Andrians, both Prado for the Alabaster Room. In 1514 Giovanni Bellini painted 'Feast of the Gods'. Media in category "Bacchus and Ariadne by Titian"